A camera factory on Park Avenue 120 years ago? Yes, Huntington manufactured more than just bricks in the late nineteenth and early twentieth century. Huntington’s photographic venture appears to have started with chickens. 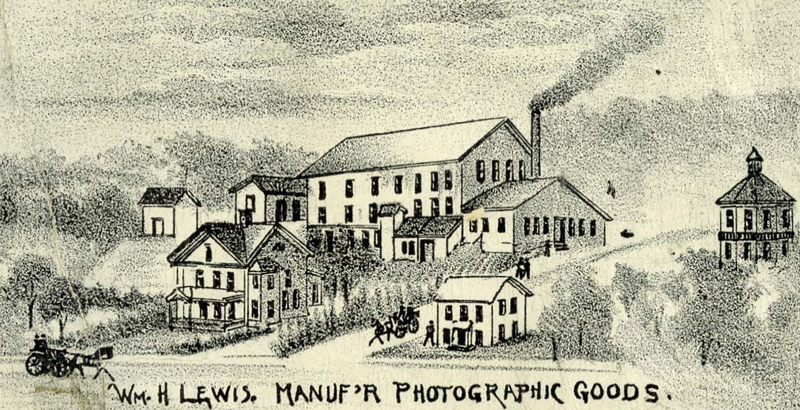 By the early 1890s, manufacturing of photographic equipment joined chicken farming. Over the next two decades, the venture suffered from a variety of setbacks, but returned to business time after time. William H. Lewis House, front left, still stands at 595 Park Avenue. The octagon chicken house is on the right. The first catastrophe occurred in 1895. On May 27, at around 9:45 p.m. a neighbor returning from a Wild West show in the village noticed flames coming from the Lewis factory. He sounded the alarm and the fire department quickly responded, but the factory and much of the inventory were a total loss. Neighbors managed to retrieve some tools and books before the fire completely consumed the building. Efforts to keep the fire from spreading to the nearby houses were successful. The loss included door frames for a new cottage in East Neck[vi] indicating that the factory was not limited to photographic equipment, but also produced millwork. But business was not good. In 1900, Republic Savings and Loan Association commenced a foreclosure action against the Lewis concern. The land, some 27 acres, was sold in late July. The factory property was sold on August 11. [x] The closing of the factory and the resulting unemployment caused Lewis’s cottages to be vacated one by one. Today the land that once housed the photo factory is owned by the Town of Huntington as part of the Heritage Nature Trail which connects the Hillaire Preserve to the Village Green and Heckscher Park.